Well, people, there are ideas I think about for some time before I blog about them. Sometimes it's just that I can't quite figure out exactly how I feel, and other times it's just a desire to make sure that whatever I have to say is said well. I've been thinking about this topic for weeks, and finally decided it was time to put pen to paper (fingers to keyboard?) about it. The topic? 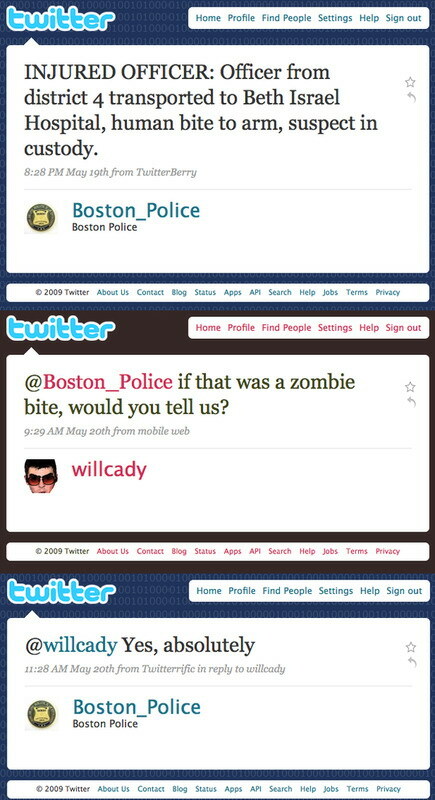 Cops on Twitter. Okay, I suppose I should call them "police officers", and I usually do, but "cops on Twitter" is much more pithy (and for some reason reminds me of Duran Duran's "Girls on Film", but I digress). The concept is one I find fascinating, and I think it has potential for our community. 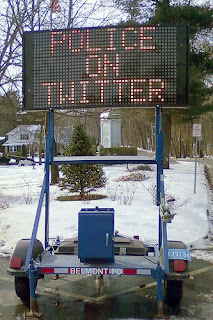 I first discovered tweeting officers when I discovered a constable (CstPower) from Edmonton Police Services on Twitter. I was intrigued. The officer tweeted about many police matters, but most often just his day-to-day job. Pulling over suspected drunk drivers. Apprehending youths with alcohol. Often what he had to say was funny. Sometimes it was poignant. Sometimes it made me angry as he was dealing with situations that would be frustrating to anyone. What I began to notice, though, was that Constable Power was no longer just a "cop", but a living, breathing, feeling human being doing a very difficult job. He was becoming quite utterly human. I looked forward to his tweets. I would reply to them, and occasionally he would reply to me, too. We opened a dialogue. So, after following him for a bit on Twitter I also began to follow his fellow tweeting officers from EPS. I even went so far as to contact the EPS communications department to ask about all these tweeting cops. The response was that it began initially as a recruitment tool, to attract those who may be interested in police work. As time went on, though, it became a community engagement tool. It became a way for these police officers to communicate directly with the public. I suspect, as I noted, it became a way for these officers to become more than just a badge - to become people. Now, I've discussed this with others, most notably Toddske of YMMPodcast, and they have expressed doubts and concerns. Many of these seem to focus on privacy issues, and I understand those concerns, but I think in a cost-benefit ratio that the benefits may outweigh potential costs. Officers who tweet would need some ground rules regarding privacy, of course, and would need to understand the potential impact of entering this social media circus. Once you have officers who are comfortable with the technology, though, and who are able to use good judgement, I think you end up with an amazing tool for community engagement. I've done some research, and the concept of tweeting officers stretches right "across the pond" into Great Britain, where the idea has been embraced by many police forces. Community policing is a very popular form of policing in the world today. Part of that involves humanizing officers, making them more accessible to the community, and making them a part of the community they protect. There is a tendency to see police officers as uniforms and badges, individuals you would prefer to avoid. And yet this does not serve the community, or the police, very well, as a tight connection between officers and the community can be a powerful thing. You can stop drug houses before they even get a toe hold in a neighbourhood. You can shut down drug dealers in playgrounds, you can address traffic speeding along a particular roadway, and you can do all kinds of incredible things - if you make sure the public is comfortable approaching officers. Once you've engaged with these tweeting officers - asked them a question on Twitter, and had them respond, as I have, you have opened a dialogue. Once that dialogue has been opened you suddenly see them as part of your world, not as something outside it - and I suspect many people would be much more likely to contact an officer about an issue once they've established that these officers are, in fact, approachable. So, how does this relate to Fort Mac? Well, we have our local RCMP detachment, and I think they do an admirable job in our community. One of the things I've noted, though, is that there is a sense of the other kind of "detachment", too. I'm not sure how many residents see the RCMP as part of our community, or as approachable. I fear that they are seen as "those cops" and not as "those members of our community that work with us to protect it". I recognize there are issues. The RCMP is a very large entity with certain protocols regarding communication - and, let's face it, they are a bit "old school". In communities like the RMWB, though, I think we have some unique circumstances. We have a very large detachment, and we have all the issues of a city but don't have our own police force (unlike most other Canadian cities). We have some problems that are not unique to us but that are perhaps more pronounced here. And, finally, we are continuing to experience rapid growth, and with that growth our policing needs will increase. With that increase will come an increased need for community involvement in policing. We will need an engaged public that sees the RCMP as an ally in the fight to protect our community, and we will need to find a way to make those officers serving us seem approachable and human. One way to do this? 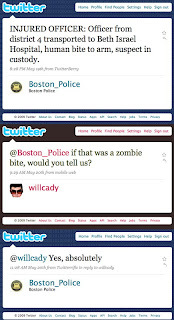 Cops on Twitter, people, cops on Twitter. There are other ways, too, but I've now been following the tweeting officers from EPS for some time - and I've seen the level of community engagement. I'm impressed, I think the idea has great potential, and I love the term "cops on Twitter". What do you think, Fort Mac?